The Kern County Sheriff’s Office is asking the public’s assistance in identifying a suspect wanted for theft. 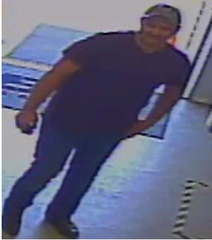 On April 25, 2016 at about 4:50 pm, the suspect depicted in the attached photo stole a large power tool from B & R Tool Supply located at 5919 Rosedale Highway. For further information see attached wanted poster and image.